Welcome back to another week of weekly meal planning. 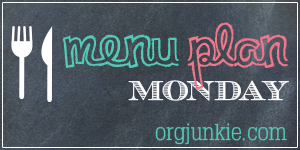 For the last few weeks, I've mentioned my own struggle with coming up with menu ideas. The struggle is real people - it's so easy to fall into a feeling like you're having the same things all the time, which leads to becoming uninspired. Then enter - Real Simple Magazine. The January issue had an article, "How Not to Make Dinner" that really inspired me. It gave me some great ideas for easy, healthy foods that my family will actually eat. In fact, three of this week's menu items were inspired by the article! I've probably mentioned before, but I do have to make slight modifications for my kids. The oldest is pretty good as long as there is meat (teenage boys - right? ), but the youngest eats about 6 things and I try not to stress over it and keep offering new things to try. It is what it is - you can't make them eat. You may have noticed that I've added menu items for Saturday and Sunday the last couple weeks. That's because with colder weather, we are spending more time at home, and I want to have some yummy options available. Also, we are working to reduce our dining-out budget. Oooh, this is a great week at your house!